Installation view of Rise and Fall (2009) at Wako Works of Art, Tokyo, 2011. Photo ART iT. An overview of recent works by Fiona Tan, this exhibition centers on Rise and Fall (2009), an absorbing two-channel video weaving together fleeting vignettes of a middle-aged woman and a younger woman going through their respective daily routines, interspersed with images of gardens, streams and Niagara Falls. 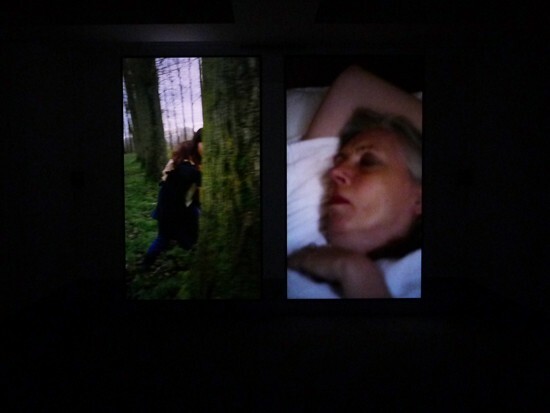 Tan’s distinctive use of the multi-channel wide-screen format, with the projections standing vertically and placed side by side, allows for virtuoso double-camera work, as in an opening sequence with the middle-aged woman lying in bed, in which the slight variations in angle, focus, proximity and movement between the parallel images imbues even the most dormant activity with an air of restlessness. In other cases the juxtaposition of different images balances ambivalently between the connotation of dream sequences, flashbacks and simultaneous action, neatly toying with film convention without gratuitously flouting its logic. Is the older woman recalling her younger self, or imagining the life of a lost or estranged daughter, or vice versa, or none of the above? Tan’s aesthetic of misalignment, of subtle rifts in image, sound and texture, keeps everything from succumbing to the potential clichés of moody atmospherics. Unusually, the newest work in exhibition is placed on a side gallery, and presented on a monitor: Hans & Helge (2011) enters the home of a pair of championship dog breeders. Also included are a new sound piece, Brendan’s Isle (2010), reinterpreting the Irish folk tale, “The Voyage of Saint Brendan,” and the black-and-white landscape photograph Närsholmen V (2008).